help you understand the language around personalized learning and agency. understand the different approaches for teaching and learning. 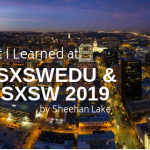 understand Universal Design for Learning as the foundation to create learner-centered environments. design Learner Profiles and Personal Learning Backpacks. have the research and resources to support your journey to learner agency. 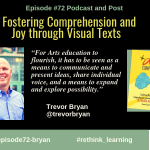 use different graphics and content to move from compliance to learner agency. help close the skills gap by empowering learners to acquire the skills needed for their future. join an online community with loads of features and resources. 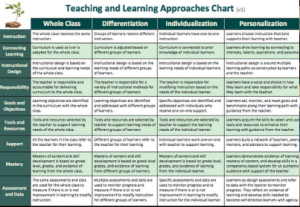 This chart is meant as a guide and to calm the fears about changing what teachers know and do around teaching and learning and is an updated version from the PDI chart. how much value a teacher is in all of the approaches and that it is all about the “person” who is learning. 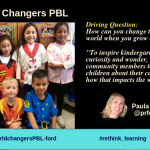 That can be the teacher who is also learning about changing their teaching practice. 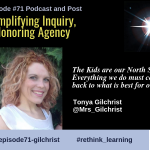 Moving to learner agency takes time for students and teachers. Students may not be ready to let go. Many have learned how to do school and may resist change. Teachers may not have the support, resources, or time to jump in and change how they teach right away. There is a link on this page to download the chart. Go to this page for details. The Teaching and Learning Continuum was designed to support changing teaching practice. Teachers may not have the tools, resources, and support to change teaching practice on their own. The main challenge for teachers is time. 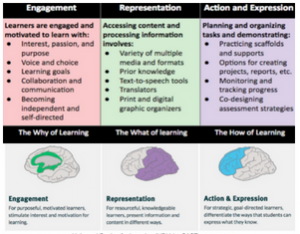 Teachers have demonstrated to me how they can use this chart to take an existing lesson and look at areas where they can bring in voice, choice, and autonomy so students start developing learner agency. Change is not easy. 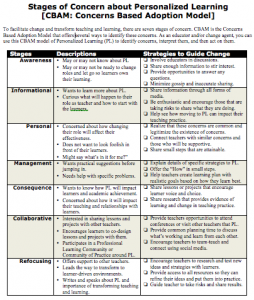 If you are planning to transform learning into a learner-centered environment, this adapted chart will help you define the stages of concern when you go through the change process. There are descriptions for each stage along with strategies to guide change. Coaches and administrators found this chart helps support transforming teaching and learning. 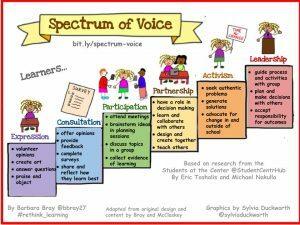 The Spectrum of Voice by Barbara Bray was adapted from the research “Motivation, Engagement, & Student Voice” by Toshalis & Nakkula for Students at the Center. The content in this post that was originally developed by Bray and Kathleen McClaskey as the Continuum of Voice* and is a new derivative developed by Bray along with new graphics by Sylvia Duckworth demonstrates how learners use voice in different ways depending on the situation, confidence, and agency. After reading more about engagement with the “Flow” theory and the differences between engagement and empowerment, It needed to be clearer that engagement is about how much any learner is engaged in a task or activity and the balance between the challenge before them and the skills they have to meet that challenge. 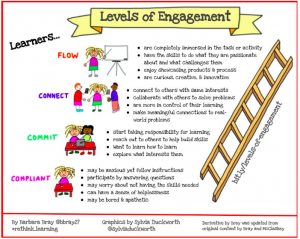 This idea of levels of engagement can pertain to any of us who are defining who we are as a learner. Many teachers believe that providing a set of pre-planned choices from a computer program or a list of options was enough to give students opportunities for choice. 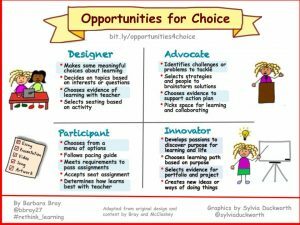 Providing opportunities for choice at different levels depends on where the learners are around tackling a task if the environment provides multiple opportunities, and how empowered students are to take responsibility for the choices they make. Most of us grew up in a system that valued sameness and compliance. 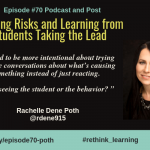 Many teachers have stated that they did not have a voice in their learning and there was no ownership of their learning except outside of school. 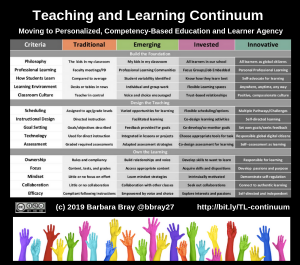 This graphic and content explain how learners can move from compliance to autonomy by teachers creating a learning environment that provides learners with choices and opportunities for growth and ownership of learning. Are your students ready for their future? Colleges and businesses are looking for people who are curious, creative, and innovative people who are motivated to unlearn and relearn. What are the skills they will need? My eCoach (https://my-ecoach.com) was created to support educators in an online safe and secure community. There are over 20,000 members. You own your content, data, and there is never advertising. Join and create websites, blogs, surveys, lessons, and projects in no time at all with everything you need at your fingertips. Clone, co-author, match to Standards, use the citation tool, allow comments, embed video, control who sees your website, and you always have access to your stuff. The eLibrary has over 50,000 resources you can use or add to your locker. You can set up teams, add friends, and build your own teams for coaching programs. So much and you can sign up for free to see if My eCoach works for you.